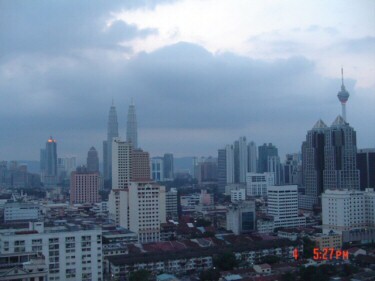 What is the Community Kampung? 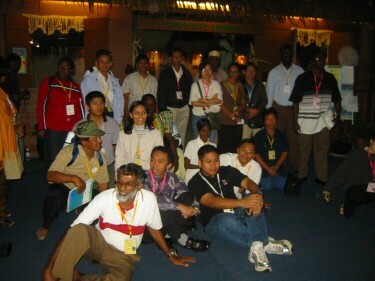 The Community Kampung is an innovative community-focused dialogue space hosted at the 7 th Conference of Parties to the Convention on Biological Diversity in Kuala Lumpur , Malaysia , from 5-20 February 2004. 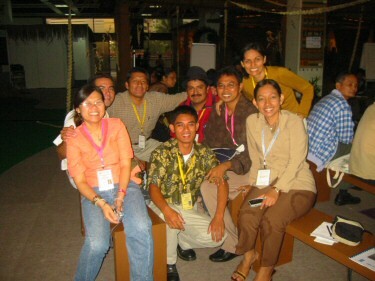 The Community Kampung is dedicated to highlighting stories on community action and grassroots sustainable development victories from around the world. The Community Kampung also seeks to encourage a dialogue about how we can best develop an enabling environment for community participation in global biodiversity conservation. 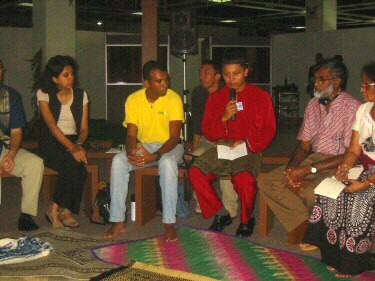 Within the Kampung, a variety of dialogue and community spaces serve to facilitate group discussions, exchanges, presentations, press conferences and media interaction. Targeted discussions will focus on the key biodiversity themes of direct relevance to the COP 7 and will bring representatives of communities together with each other and with international leaders for interpersonal, intercultural, and interdisciplinary dialogue. 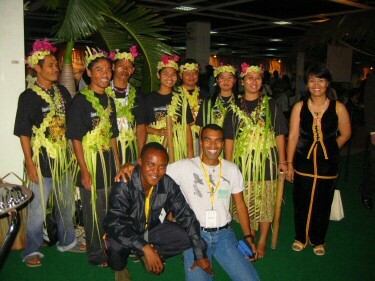 Among the many community members for whom the Kampung will serve as a 'home-base', will be the representatives of the 26 Equator Prize 2004 finalist communities . The Community Kampung concept note and brochure provide full details. What Issues Does the Community Kampung Address? 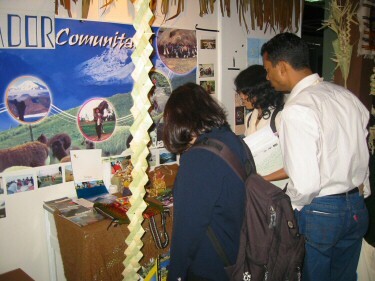 The Community Kampung is dedicated to highlighting the importance of local community action to biodiversity conservation and achievement of the Millennium Development Goals. Poverty-environment linkages will be a central theme, as will be the topics of social inclusion, participation and gender equity. Other themes to be explored in the Kampung include the nexus of people and protected areas, community leadership in conservation area planning and management, the role of Indigenous and Mobile Peoples in conservation, poverty eradication and eco-agriculture. 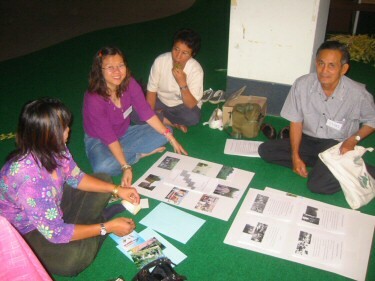 The Community Kampung will provide a dialogue space to deeply explore the "local communities and biodiversity" linkages. It will also provide a context for moving towards new partnerships for biodiversity conservation and poverty reduction. The Community Kampung will serve as an important opportunity for these issues to be voiced and addressed directly by community leaders on the international stage. 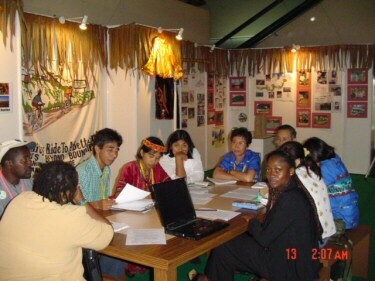 Special attention will be given to representation of indigenous peoples and those groups whose livelihoods are most affected by biodiversity loss and environmental degradation. Communities who have successfully addressed such problems through partnerships and dialogue will present their cases and experiences at the Kampung and will help to create inject a spirit of self-driven positive achievement into the heart of the Conference of Parties. 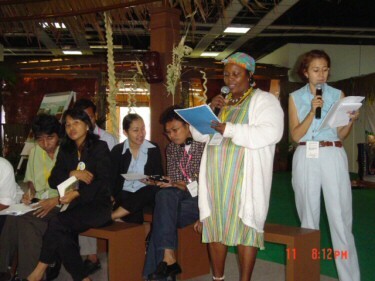 The Kampung will demonstrate, in the heart of this important global meeting, that community members, often working in partnership with local governments, local and national NGOs, and international organisations, are increasingly taking action to meet their basic needs while preserving the biological resources on which their - and everyone's - future survival depends. As community delegates continued to arrive, an excited atmosphere of orientation and communion prevailed. Struggling with names from distant and unfamiliar parts of the globe each finalist donned a nametag and a repertoire of facts about their home and respective organization. Interpreters assisted those less familiar with English and soon everyone engaged in lively exchange. As the COP7 got underway, the Community Delegates welcomed interested parties from IDRC, SwedeBio, various NGO's, and the German Ministry (Federal Ministry for Economic Co-Operation and Development). One of the most important activities of the day was the "Local Global Leaders' Dialogue", which took place in the Kampung following lunch. For a full report on the Dialogue, please visit here. Participants met in the morning to continue their working groups and discussions. Benny Roman from the Torra Conservancy started the day's presentations with his discussion on the work his organization does in Northwestern Namibia. The Torra Conservancy - an Equator Prize 2004 finalist - manages 352,000 hectares of land in the Kunene region. 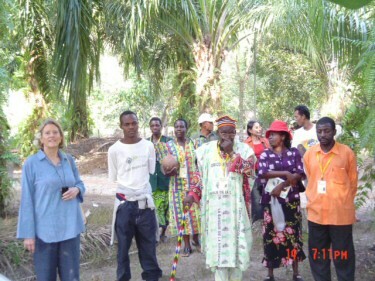 Working in the areas of sustainable hunting and ecotourism, the group has been successful in generating much additional income for the community. Inviting questions from an Indonesian delegate the discussion included the process that evolves when electing management committees..
Ana Lucy Bengochea, a representative of the Garifuna Emergency Committee - an Equator Prize 2004 finalist - started the day with a presentation about the work her organization does on the northern coast of Honduras . 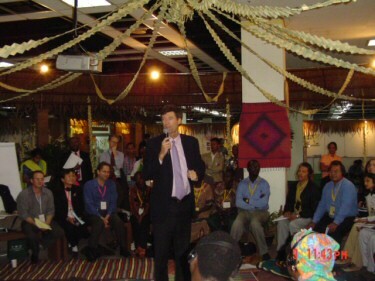 Although the Emergency Committee originated from the initial activism surrounding Hurricane Mitch in 1998, the group is now involved in many conservation and poverty alleviation activities. The morning began with a set of limbering stretches led by BK Benthoa here representing the Equator Prize finalists from Sri Lanka. After discussion of the upcoming overnight weekend field trip arranged for the participants, discussion turned to the break out groups for the morning. The morning was spent presenting the messages prepared by the working groups and developing a plan for the presentation of the messages at the Awards dinner on Thursday. After a morning of further preparations for the delivery of the community messages at the dinner on Thursday, Marcelino Apuran spoke representing Capitania del Alto y Bajo Izozog (CABI) in Boliva. CABI is an organization that represents the indigenous Izoceno-Guarani people. 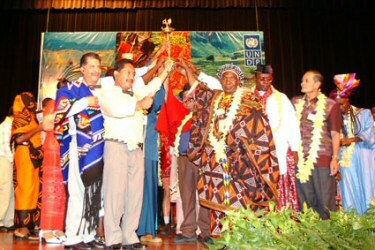 Their work includes securing land rights and creating a National Park and Integrated Management Area. The day began a little later than usual giving people an extra hour of well needed rest. Beginning the day by opening the last round of community presentations, Miguel Garcia and Oscar Jimenez spoke on behalf of the Fundacio Pro Reserva Forestal Monte Alto in Costa Rica. Their organization began in 1992 and works to preserve biodiversity through a variety of activities including education initiatives, ecotourism, and strategic land purchases. Today was a day of sharing and celebrating not only the prizes that were awarded last night, but also the two weeks that brought many new friends, new ideas, and new stories that will last a lifetime. 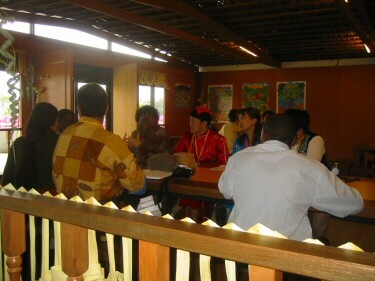 After meeting shortly after 10:00 am His Royal Highness Fun Ngum performed a traditional closing ceremony. Although everyone is tired from the two weeks and long for friends and family back home, everyone feels strongly about making a final statement expressing how the experience has moved and changed them.